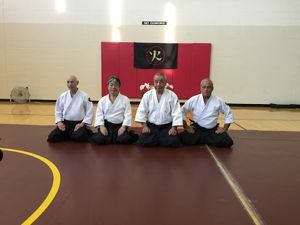 Our stay in Denver came to an end and Igarashi shihan, Mr. Kasahara and I proceeded to Omaha, Nebraska on a flight that took about an hour and a half from Denver. 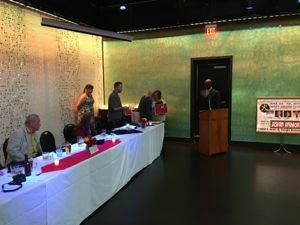 It was to celebrate the 25th anniversary of Ron Christenham shihan's Sarpy Aikido Club in Nebraska. Ron Christenham shihan is the director of the Midwest Region of Aikido of Hawaii International. This was Igarashi shihan and my first visit to Nebraska. Christenham shihan and all his dojo members met us at the airport. My first impression was of wide, tree-lined streets with verdant green lawns and gardens. Aikido of Hawaii International head Robert Kubo shihan first encountered Aikido in 1953, when he was taught by Tohei Koichi shihan and became his deshi. Hawaii is home to the biggest number of first and second-generation Japanese-Americans, including many veterans from the famous, much-decorated 442nd unit of American soldiers, who were Japanese-Americans and who fought so fiercely in World War II. Many of these Japanese-Americans became deshi, and even though Japan was defeated, they became interested in their ancestral home country and the good aspects of its traditional culture. They placed their trust in Aikido and asked for a shihan from Hombu Dojo to come and teach and that was Tohei shihan. Ron Christenham shihan began his Aikido practice when he was living in Hawaii. I've been going to Hawaii since 1975 and recall meeting him at practices. Christenham shihan has been training for a long time as well as instructing. He has even a deeper interest in things Japanese than Kubo shihan. 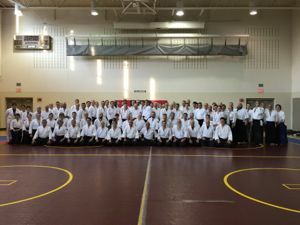 He and his wife eventually moved to Nebraska where he began teaching with his son as a partner, impressing everyone so much that he was able to open a dojo in Omaha. And now here is his 25th anniversary. 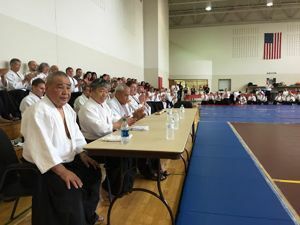 Unfortunately, Kubo shihan was not able to attend the festivities because of a sudden illness, but his wife, Eva, helped arrange the entire program and was in attendance. The instructor representing Hawaii was Thomas Kaulukukui shihan. To cure Igarashi shihan, Mr. Kasahara and myself of fatigue, the first night was a gala welcome party. Earlier in the day, we had toured an airport museum and a safari park. For details on these tours, please see Mr. Kasahara's blog. 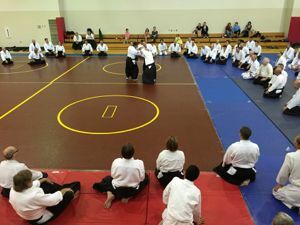 The Sarpy Aikido Club's 25th anniversary seminar was held in a basketball gym where mats were put out for over 100 people. 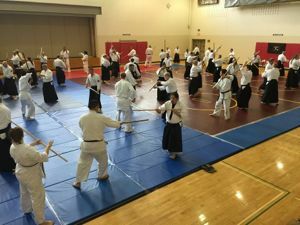 Kaulukukui shihan, Igarashi shihan and I taught one hour classes with 15-minute breaks. Altogether then there were three hours of training. 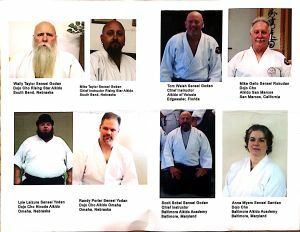 When the shihan who was to instruct stepped on the mat and stopped to teach a technique, the Hawaii International members were the only people who would listen respectfully but not sit down, whereas the members of other associations who were participating would sit in seiza, so you could immediately see who was who. When a shihan is correcting a technique, it's usual in most countries of the world that the people practicing all sit in seiza and observe. (See the Soshihan's blog for April, 2008 for a discussion of this). This was the method of instruction used by the founder, Ueshiba Morihei, as well as Kisshomaru Doshu in Hombu Dojo. There are many Dojos all over Japan who also use this style of teaching, but when I opened Aikido Kobayashi Dojo, I consciously ended the practice because in a dojo of thirty or forty mats with twenty or thirty people training, if every time an instructor explains something and everyone around sit in seiza, there's a danger others will collide with the people watching, or lose practice time. I opted encouraging safety and continuity in practice. Kobayashi Dojo members should follow the tradition of teaching and practice in whatever dojo they are visiting. The practice with Igarashi shihan and Kobayashi Yasuo was four hours with just a fifteen-minute break. Igarashi shihan focused on katatedori, tenkan, and kaiten, so there wasn't much ukemi in the practice. That was two hours. People training were doing very well throwing their partners and then being thrown. People reach their physical limits. So as not to tire people too much, I decided to teach Jo; left and right jodangaeshi to hasso, walking and blending with a partner. Since there were people from dojos that don't practice the Jo, it was an excellent opportunity for them to study the movements of the Jo more closely. Everyone seemed pleased with the practice. Practice was three hours, from 8:45 until 11:45. Kaulukukui shihan, Igarashi shihan and I taught. Two of the instructors concentrated on standing techniques, so I focused on the Jo 13-kata. Everyone at practice had done some Jo, but the individual instructors in the various associations teach differently. Of the people on the mats, 90% did not know the 13-kata Jo, so I filled my allotted time. 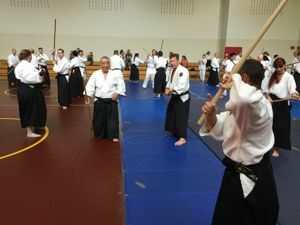 At the end of practice, representatives from the five associations that were participating in the seminar gave demonstrations to everyone's delight. It was an extremely successful event. 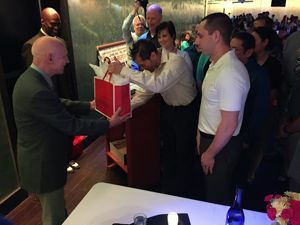 At the anniversary party, gifts were exchanged and presented to and from the associations. A professional musician who was a member of the dojo there performed for the occasion. 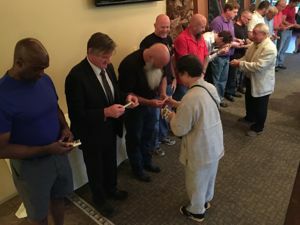 I feel that everyone was murmuring that this was the mellow kind of event Ron Christenham shihan had been yearning for. Everyone learned a lot. It is my hope that Aikido Kobayashi Dojo can have many exchanges with this group in the future. 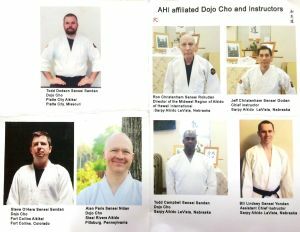 Instructors of Sarpy Aikido Club and its affiliate dojos.